Ampoint Distribution Services provides total third party logistics (3PL) services at the right location. We combine over 20 years of experience with state-of-the-art technology to provide flexible, same day service to our group of regional, national and international customers. With multi-vendor consolidation for single truckload deliveries, costs are shared per truckload, reducing the costs you pay to deliver goods. By outsourcing to a qualified third party logistics company, our employees act as an extension of your company, freeing up your employees to concentrate on your business needs. With long or short term contract warehousing, pay only for the warehousing space you need. Have the flexibility to stock more merchandise during your peak season, meeting your higher customer demand. Store less merchandise when your demand is lower, during your off season. 3PL with contract warehousing offers your business a flexibility that maintaining your own warehousing facilities doesnt. Highly Competitive Pricing  Because you are sharing the load with other companies, a third party logistics facility and warehouse like Ampoint helps you become more competitively priced. 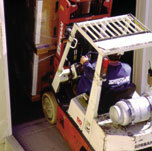 Ampoints third party logistics (3PL) services can be your partner to deliver the goods for you. See our location page for our close proximity to major interstates.